After his well received UK Runnings mixtape ‘Partly Fledged’ dropped back in May, our HHLAT brother Nephilim is back with his second release of 2015 with his new EP “I’m Just Not Sure Anymore”, produced entirely by Scottish label Burgh Records. Nephilim aka Neppy has been performing on stages from Bristol to London this year and has performed at a number of Beats & Bars events across the country too. To add to that Nephilim has also become a member of Unit 731 a group which consists of selected producers & artists with a variety of different skills. Towards the end of the summer Nephilim had heard some instrumentals that he liked and hit up myself and Tricksta up to see if we knew anyone at Burgh Records, I gave him a contact name and pointed him in the right direction intrigued how it would pan out…. ‘Note To Self’ begins with heavy drums and dark haunting strings as Nephilim really breaks himself down and gets inside his head examining his own frailties and insecurities, that if were all honest with ourselves we all carry similar doubts an insecurities. The track ‘Stricken’ continues with the dark theme with Nephilim examining being at your lowest, looking for that spark to reignite life. Then we finish with the upbeat reggae/dub vibe of ‘The Return’ with Singer Dread featuring on the hook, this is a complete flip to the previous joint with Nephilim finding that spark and getting back on track with positivity that finishes this journey of emotions and inner most thoughts through the EP. Nephilim has raised his game on so many levels with this EP. 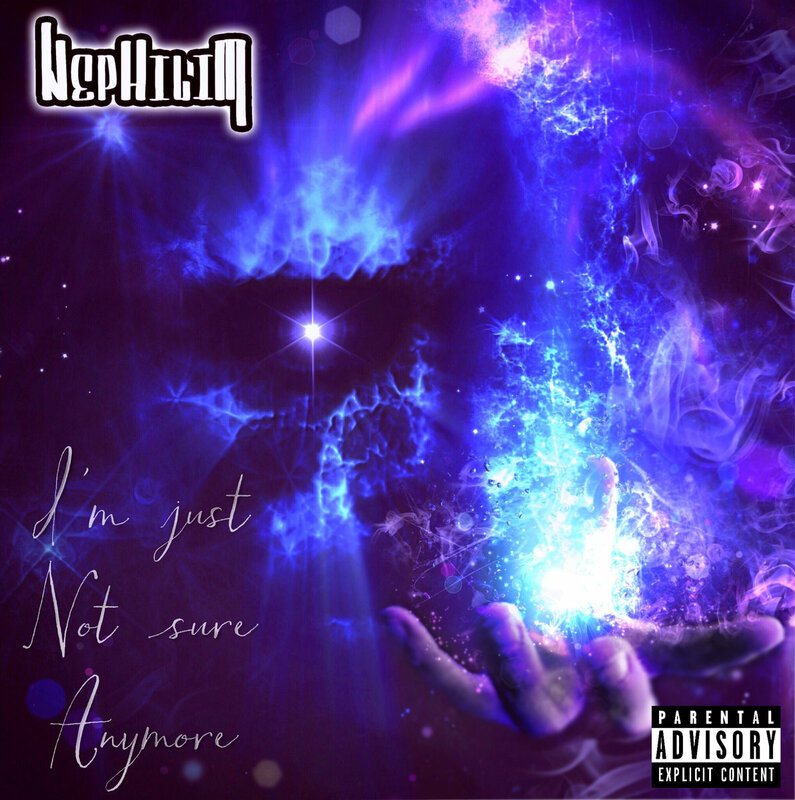 “I’m Just Not Sure Anymore” is like opening a page of his diary and getting a piece of his most intimate thoughts, he’s not like many rappers we have here in the UK there is a rare honesty and uniqueness to the way he articulates his thoughts. As for delivery, flow and lyrics he’s showing yet further development switching flows up mid verse and proves to anyone out there trying to make it out there as a rapper, that the best way to develop and hone your craft is LIVE shows. You can be the sickest rapper in the studio and had a million free download releases, but nothing really compares to rocking a crowd and building a connection with an audience seeing how they react to your lyrics. Nephilim has grown in confidence this year and it’s clearly evident in his music, he has really set the benchmark high for himself with this dope release, but don’t take my word for it stream and download “I’m Just Not Sure Anymore” here…. Entirely produced by Burgh Records. NEW heat from Cult of The Damned as Lee Scott, Barebase, Sleazy F Baby, Black Josh, Stinkin Slumrok, Bisk, Bill Shakes, King Grubb, Sly Moon, Salar & Tony Broke go in on this ill posse cut over Dr. Zygote’s dope production. Sick track from Diamond of South London’s Present Minds featuring Logic Army and Kropz – ‘Like The Leaves’, Exclusive release off of Diamonds upcoming “Entheogen Project” out in January. A behind the scenes look at rehearsal for the Global Spin Awards 2015. Check out the Doobie Brother’s Routine that was the show opener featuring Scratch Bastid, Chris Karns, Jerermy Ellis and Kaila Mullady. DOPE! DJ Kefran featuring Wonda Wendy “Dreamer”, this fresh single is from the forthcomming DJ Kefran’s LP. UK emcee Haze delivers a thought provoking song titled ‘True Forever’ reflecting on how he views society, humanity, where we are and most importantly who we are. Meaningful music with a message.